Bikes and jeans go together like beans and toast but Ducati has decided to take this fashionable love-in one step further with the creation of a distinctly denim-flavoured Ducati Diavel model. Limited to just 666 numbered units (Diavel means “devil” in Italian, geddit? ), the collaboration is said to be, “inspired by a hyperkinetic dynamism of a post-apocalyptic, retro-futuristic world”. 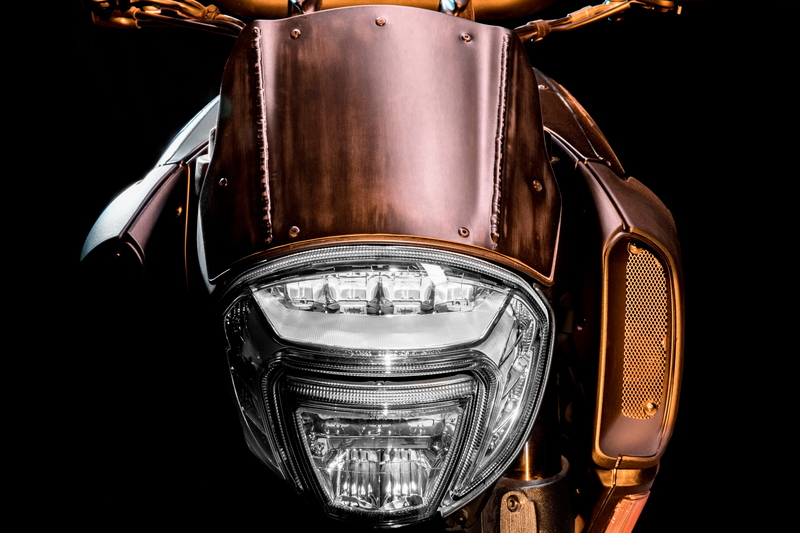 Digging through the marketing bull, we can tell you that the Ducati Diavel Diesel is distinguished by a hand-brushed stainless steel superstructure with visible welding and rivets. 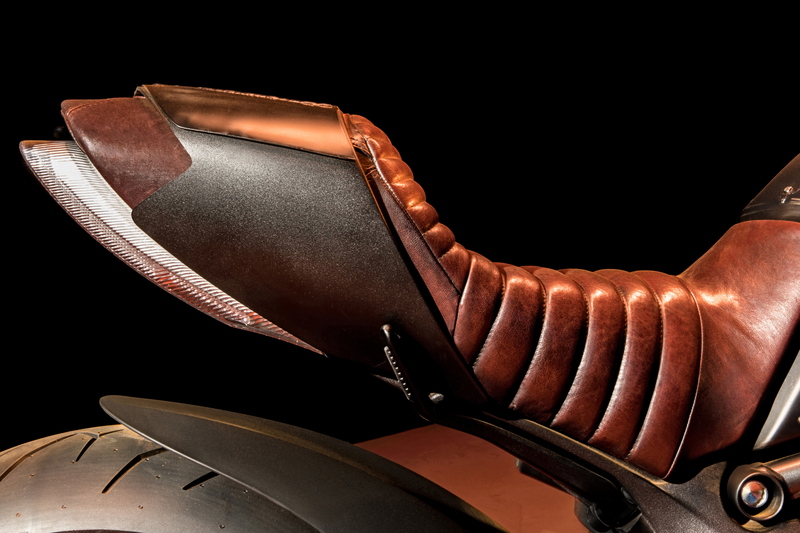 Details, such as the tank cover, front cowl and passenger saddle cover have been hand-tinkered to lend it an almost cottage industry aesthetic. 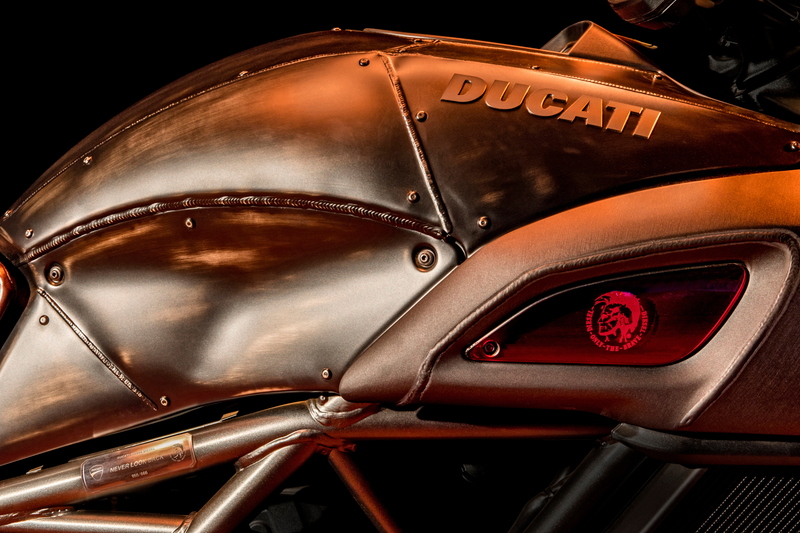 The saddle, which is made of real leather, is unique to this Diavel, while the lateral air intake covers are made of red methacrylate with the Diesel logo smuggled inside. Ducati describes the limited Diavel’s exhaust system as a ‘work of art’, explaining that the pipes have been finished with a black Zircotec ceramic coating and black silencers, beefing up the already menacing appearance of the Diavel somewhat. The 162hp Testastretta engine remains un-fettled, although that sort of grunt is more than enough for most, while the selectable riding modes and advanced safety package (ABS and Traction Control) remain in place just in case. There is currently no word on pricing – nor has Europe-wide allocation been announced – but you will be able to buy a Diesel ‘capsule collection’ that will feature various Ducati-themed items of clothing to match your new bike.